First mechanical zone control ive seen, whats do if heat and cool get called? You have to physically touch the equipment?! Yuck! That just sounds unsanitary and possibly dangerous - what happens if I cut myself on a sharp edge, then the 1985-era germs, to which I'm surely not immune, get inside of by body?! what then?! If you can't have Alexa or Siri turn it on for you, or at least through a phone app from the safety of the driver's seat of my car on the highway, I can't imagine any reasonable person using this system. Its kind of like a a reoccurring calendar event to “check filter”. Then you look and see which light is lit. Green for cooling, red for heating. Those are some purty schematics. Not sure the Noobies in the field today would know how to read them, so we should probable just eliminate most of those components. Just run the the thermostat wire to the device; don't need no stinkn' wiggly diagrams. Seriously though, it really is a treasure to find a quality drawing. 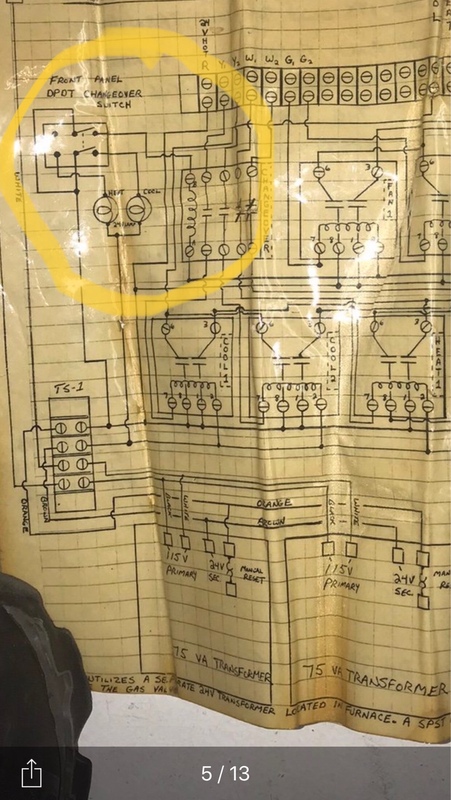 I posted some pneumatic diagrams from several decades ago, before dual input receiver controllers were sold, I think they're pretty cool. Can post them again if you want. Okay, they're white lines on black. Encased (actually, sewn) in plastic envelopes. I'll make a note and try to do it tomorrow eve. Most techs nowadays have never seen things like these. These are pneumatic drawings. Old school. Back before they had dual input receiver controllers. Notice how the branch of one single input receiver controller was used as the main for another single input receiver controller. That's how they did reset (with two inputs) prior to God inventing a dual input receiver controller. Pretty freakin' cool if you ask me. That's where I cut my eye teeth in this trade, LOL.